Edwards resident Marlin Smickley, 80, plans on running the Vail Recreation District's half marathon race in Camp Hale on Saturday, July 21. Smickley participates in all of the rec district's running races, and says while the half marathon is his least favorite, he keeps a positive attitude about it and makes a goal to finish, even if he has to walk most of it. 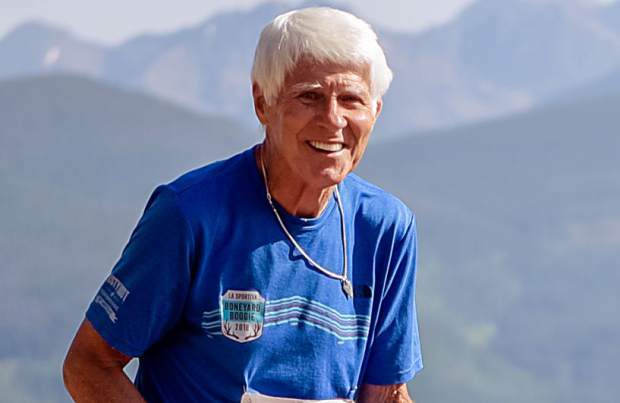 EAGLE COUNTY — When Marlin Smickley runs the Camp Hale Half Marathon on Saturday, July 21, it will be his first race as an 80-year-old. Smickley takes part in all of the Vail Recreation District’s running races as part of his commitment to stay active, involved in the community and surrounded by young people. He’s not exactly excited about the half marathon, calling it his least favorite of the series, but he’s keeping a positive attitude about the competition, because that’s what he does. When Smickley encounters a quote that he likes, he prints it out, and onto the refrigerator it goes. The collection is always growing because Smickley is always reading. In addition to running and reading, Smickley’s hobbies also include gardening and, believe it or not, working. He dedicates a couple days per week to his property management business, where he takes care of roughly a dozen homes in the valley. He also volunteers for many of the Vail Recreation District races that he is not participating in, such as mountain biking and Nordic competitions. Smickley said he has always understood working to be an important driver of purpose and was recently reminded of that while reading an article about Willie Nelson. “He’ll never retire, and he’s 85,” Smickley said. Citing the book “What Really Matters” by Karen M. Wyatt, Smickley said your purpose is directly related to your mental health. “No matter what age you are, have a purpose,” he said. If Smickley’s mind is a map to youthfulness, then he’s quick to point to its key. When he plants a quote on his refrigerator, he can tell you where it came from, drawing as much inspiration from the source as the passage. Smickley can even tell you the source of his inspiration to post the quotes on his refrigerator in the first place. As a school teacher in the ’60s in Pennsylvania, he was invited to attend a workshop hosted by Zig Ziglar. It’s not surprising to see Smickley take a code cracker’s approach to youthfulness, breaking down where his theories originate. Before becoming a school teacher, he was trained in coding and decoding messages by the U.S. Army. He spent nearly three years in Japan working on that craft. “I had gotten out of the Army and I worked with the CIA, and I knew that my life with them would not be the, quote, ‘normal American family life,’ so I quit to be a teacher,” he said. The Army paid for him to receive his education. Smickley spent the next 33 years as a teacher in the Pennsylvania school system. He said he’s really glad he made the decision to go into education, rather than sticking with the code breaking. The code cracker’s mentality never really left, though. Ask Smickley a question about longevity — such as the connection between drinking alcohol living longer, for example — and he’ll break down the origins of the question, asking if you’re certain those studies weren’t funded by the alcohol industry. Smickley is not a daily drinker and points to a recent New York Times article, which uncovered that the officials at the National Institute of Health engaged in a campaign to obtain funding from the alcohol industry for research that connects alcohol to a healthy diet. For his own diet, Smickley eats as many fresh vegetables as he can; he buys them from the Edwards market every Saturday. He eats a lot of chicken, and you might be surprised to hear him say, “I don’t think I eat enough red meat,” in reference to some advice his doctor gave him about being low on vitamin B12. While Smickley’s not much of a drinker, it doesn’t mean he won’t enjoy the occasional glass of wine with friends. The key to healthiness there, however, is not the part about the glass of wine, he said. It’s the part about the friends. Smickley participates in several running groups, a yoga group, an interval training group and a gardening group and spends a lot of time with his neighbors in Singletree. For his 80th birthday last week, his friends threw a few parties for him. “They said, ‘We had this just to show you that we do love you,’” he said. With an eye toward history, Smickley said he’s careful not to succumb to the views older generations often hold toward younger generations. Smickley goes to great lengths to spend time around people younger than him. He talks to his daughters on a regular basis and is currently planning a trip to Bryce Canyon and Zion national parks in Utah with one of his daughters.